Our phones are such a huge part of our lives that seeing 7% on the battery indicator can be as alarming as feeling ourselves about to pass out. But while we all know what to do to boost our own energy, it's not always obvious how to keep our handheld devices fully (or partially) charged. This will give you an idea of what your biggest drains are and let you effectively target your battery conservation efforts. Manually reducing your screen brightness is one of the most effective things you can do to improve battery life, though you'll likely have to manually increase it again when you're outdoors in order to read the screen. 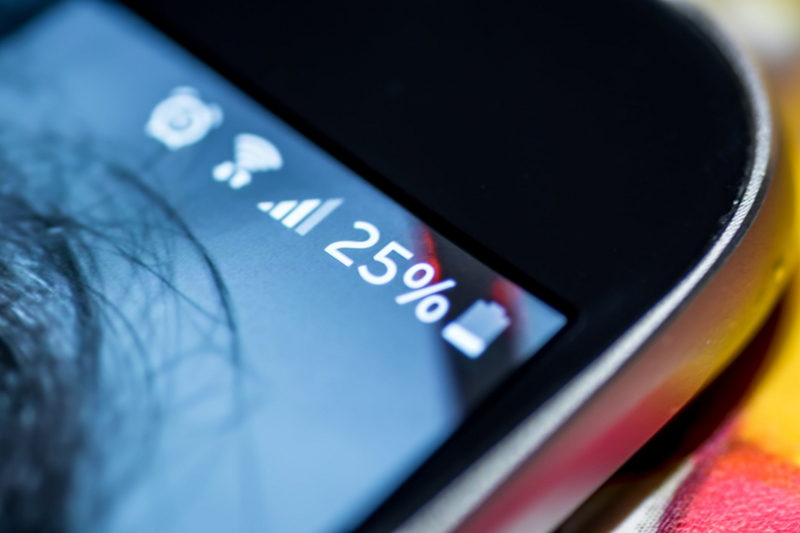 Some people have found they can nearly double their battery life by going from maximum to minimum brightness. GPS is usually the largest and most noticeable battery drain, but Bluetooth, Wi-Fi, and your mobile data antennae use power, too. While you may be loath to cut yourself off from the world, you probably aren't using Wi-Fi during your nature hike, and some people may rarely use Bluetooth. If power's tight, cut down your data links to what you're really using. The motor that makes your phone vibrate actually takes a fair amount of juice to power, and can drain your battery quickly. If you're low on battery, make do with visual or audio alerts. Do you really need to know instantaneously when someone has "liked" your Facebook status? If you can wait until you open the app to get updates, you'll save a little juice. You may need to leave some of them running (like your email), but you may be able to do without others, like Instagram, Facebook, or Twitter. You may find you can further preserve battery life through individual app settings. For example, you could reduce email sync frequency or disable auto-upload of photos. This one's simple enough: Make sure you're running the most recent version of all your favorite apps. Developers often optimize old code to run more efficiently. Not every phone has a power saving mode, but if yours does, it can be a quick way to drastically decrease your drain in a pinch. Besides throttling down the phone's processor, this kind of feature usually works by turning off some of the non-essential, aforementioned features on a single tap. Check your "Settings" menu to see if the option is listed. While it might not make a difference to an individual charge, heat can degrade battery performance over time. Try not to leave your phone lying in direct sunlight, and consider changing or removing your case if you frequently notice it running hot. "Captain, She Needs More Power!" Don't want to fiddle with all these settings? Pick up a portable charger and keep it topped off, so you always have an extra power source in a pinch. Many modern cell phones have between 2,500mAh and 3,000mAh batteries, and DealNews regularly lists battery backups even above that range for under $10. If you're willing to pay a bit more, you can easily find portable power banks that have 20,000mAh or more. That's enough for a day's use of even the most power-hogging applications, or more moderate use for extended periods — such as camping trips or power outages. Erin Coduti is a contributing writer at dealnews. Republished with permission.